San Carlos Toyota 4runner Repair - A+ Japanese Auto Repair, Inc. The Toyota 4runner is one of the most popular sport utility vehicles that we see at our car repair facility. The Toyota 4runner has been sold worldwide since 1984 and been a favorite of our clients ever since. As a matter of fact we still have a few 1980’s 4runners coming through our doors. The first generation of 4runner was basically Toyota’s 1983 Toyota pickup truck with a row of seats in the bed and a fiberglass cover. The Toyota 4runner has come a long way since the first generation. Today, A+ Japanese Auto Repair Inc. has the opportunity to service many 4runners weekly. This is a wonderful platform if you are looking for a rugged 4wd vehicle to get you to and from the mountains. The Toyota 4runner has progressed through 5 generations since 1984. In 2009 the 5th generation Toyota 4Runner was released. 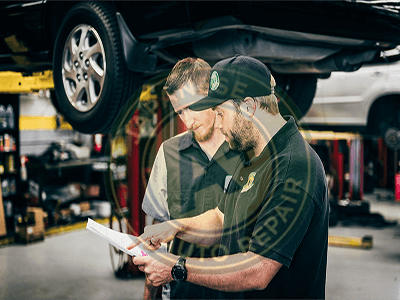 Our car repair mechanics are ASE certified and trained to service the power train, transmission, and electronics on all Toyota vehicles. Recently we have had 3 auto repair mechanics acquire training on the 2.7 liter (2TR-FE L4) and the 4.0 liter (1GR-FE V6) engines that Toyota has equipped the 5th generation Toyota 4runner with. We also have expert trained mechanics that can service the many transmission varieties in the Toyota 4runner. The Toyota 4Runner & A+ Japanese Auto Repair Inc.
We are experts when it comes to Toyota 4Runner Repair & Service. We started working on Toyota 4Runner vehicles when we opened in 1997. With numerous years of repairing the Toyota 4Runner we are now known as the best alternative to the dealer for Toyota 4Runner car repair and service. A+ Japanese Auto Repair uses ASE Master Certified Repair Mechanics and the same high quality parts as the dealership. We perform these car repairs and services at a far better price than the dealership. We also offer a 24 month / 24,000 mile warranty on all auto repair and service performed on your Toyota 4Runner.